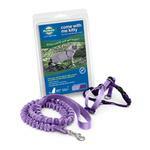 The Come With Me Kitty Harness and Bungee Leash in Lilac helps your indoor kitty safely enjoy the great outdoors. Adjustable harness creates a custom fit for your cat. Think cats can't enjoy the great outdoors? Think again! With the Come With Me Kitty Harness and Bungee Leash, you can help enrich your cat’s life with the sights, sounds, and smells of a safe outdoor experience. It gives you gentle, comfortable control of your cat or kitten. Now you can share enjoyable walks, exercise, and playtime outside your home. The bungee leash was specially designed to gently and securely control your cat. When your cat moves forward, the leash flexes with your cat’s movement and tightens across the harness shoulder straps. This removes pressure from the delicate throat area, preventing your cat from choking or escaping. In a few short training sessions, you can show your cat that your yard is a fun place to explore. Keep it short and pleasant at first, allowing your cat to explore at her own pace and escape back to a safe place if she feels scared. great website easy to use!